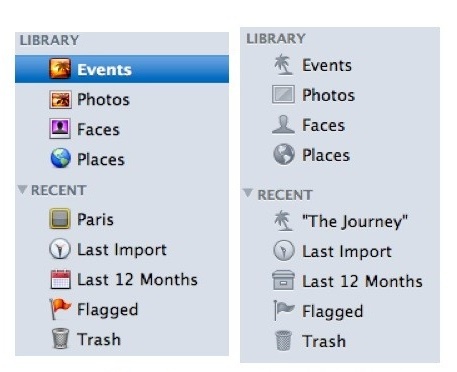 Please note that Apple has made discrete changes in iPhoto. If the version number went from 9.1.3 to 9.1.5, those who have used it have noticed better respond to the aesthetics of Mac OS X Lion. Just like the Finder and iTunes, the elements on the left bar are much less colorful than before. It is recalled that during the WWDC keynote, Phil Schiller is demonstrating a version compatible with versions of Pages and the system of full-screen Lion.